A friend let me borrow the audio version of the book Heaven is for Real. First of all, I have to comment on the writing itself. It was delicious! Rich in its descriptions that would rival the best of fictional books, but it was an account written by the father of a boy named Colton who had visited heaven. I was so glad my daughter listened to most of it with me, because I would stop it now and then to comment on the writer's imagery and I could see she was processing how the writer painted a canvas with his words. As the father had written at one point, I too believe that God, Jesus, Holy Spirit, heaven...all of it is true, but there was something so confirming listening to the remembrances of the boy. I am so hungry for heaven now. Previously, I really did not get what heaven might be like other than in my mind it would be so different in indefinable ways, but maybe it is not a different as I though it would be. For one, it became clear to me that God originally formed Adam and Eve as He wanted us to be. We as beings are still very much ourselves in heaven. I really do not know what I thought we would become there, but I thought we could be changed immensely somehow, nearly unrecognizable to what we are in the flesh. I also never thought that there would be children in heaven, but that age would have no bearing there. Since what is spiritual can cancel out what is logical here, I just assumed that the spirit of a child would be the same as the spirit of the elderly, but it makes sense that God allows a baby to develop in heaven. 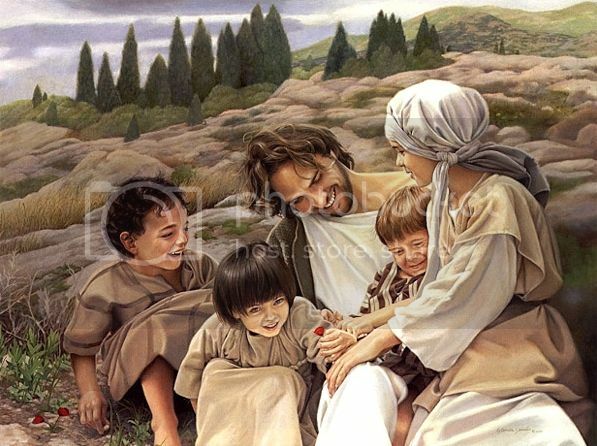 The one thing that really hit me was how much the boy seem to emphasize that Jesus loved children. That to me translated to how much He loves me personally. I am not a child in the sense of my age and development, but I was and still am His child. The boy mentioned that God the Father adopted the children, so when I sing the words "I am a child of the One True King" it is not just wishful thinking. I really am. Wow! Between the accounts of visitations to heaven by Colton and Akiane, I have changed my perspective quite a bit. I was a bit afraid of passing on, as we tend to all fear the unknown because heaven was largely unknown to me (still is in many ways), but now I am just hungry for heaven! I am anxious to go there, like a child wishing to go to an amusement park. Actually, it changed more than just my fear of the unknown and my sometimes wondering if God really does love me, I was thinking about all the children that were going to heaven everyday. Is it any wonder that the Lord allows this world to continue? While He hates evil, He is also receiving the children who died from evil deeds and illnesses due to our fallen state, all those children He so much loves into His Kingdom, a truly wonderful place where no evil exists. So, no matter what happens here that causes our death, there is a far better place to which we go...if we are believers. So, what does God really find valuable? Children, people, everyone, and even me! It is one thing to know that and it is another to experience it or just truly accept it. I tend to wonder why God allows the world to continue as it is when it is so determined to reject Him, but now I realize that even as corrupted as this world is, through it is produced what He loves: people. It even produced me and He loves me. So, while I am in the process of accepting this on a personal level, it came to me that God treasures us. We are His treasure and He wants more. The very cool realization for me this day is that the only thing we can take with us into the Kingdom is what God treasures: people. It is not just about getting someone to accept Jesus so he will be "saved." It is not about hiding away and being protective of Christianity or even our own lives, it is about bringing one more person to God. It is about living our life giving the God we worship and love what He treasures. The truth is I have not been one to treasure people as a whole. My Lord is obviously working on me about that a lot lately. I have a small number of friends whom I treasure, but I certainly have not been looking at a stranger thinking this is one of God's precious treasures, whom He loves. God is changing my heart and it has been rough moving over to understanding and accepting His perspective about people because it is so convicting and revealing how inadequate my love for other people is. In a way, it makes me sad for all the years I spent trying to feel His Love and to seek His Heart, when it now is so obvious that I was missing what He treasured. Again, it is one thing to know it like we are called to spread the Word so others can be saved, but it is another to think that bringing Jesus to people is how we bring what God treasures to Him. He treasures me. He treasures you. He treasures the lost people in the midst of their evil acts. How can that amazing, awesome love He has for us be overpowered? It cannot. Let us bring what He treasures with us!